Designing my Generation 2 waste oil boiler. Re: Designing my Generation 2 waste oil boiler. Nice work Marty. Looks like you are getting all the bugs worked out. I am curious about a few things; Such as the cfm rating on your compressor, and how long it cycles for when the burner is lit?, The gph rating of the nozzle? - I did not see any specs for it on the website. Also, did you need to adjust the burner air registers, and if so, how did you determine the setting? In one of the photos, they appear to be blocked off, but that could be an optical delusion. Anyways, we are always looking to reduce costs, so I am following this thread with interest. According to CKBuners you only need a compressor that can put out a few CFM at most at 15 PSI. Mine is 17CFM at 175PSI and the compressor is mounted on a 60 gallon tank in another building with a 30 gallon mounted on the shop wall so with 90 gallons of tank the compressor doesn’t even notice when the oil burner is running. I have a old portable compressor on a 20 gallon tank (I think) and I’m gonna cut the wheels and handle off the tank and mount that over head at the burner and regulate that tank down to 70 psi or so then use a full size regulator to take it down to 15 PSI from there as i’m tired of the creep that seems to be inherent in all these mini regulators. I may have to do a bit of rewiring and add another compressor control, currently the compressor will only run when the shop lights are on. The previous one burned itself up when a line cracked and it tried to run all night at 100PSI. The nozzle I’m using is rated at .80 GPH, all of the air opening are blocked off but one set of slots on the adjustable band. I went by a combination of what gave me the lowest readings on the CAD cell when lit then closed it a little at a time until I had a 100 percent successful firing rate. The insides of the combustion chamber is lined with a fine gray ash which is desirable. I also have a friend that works for a major HVAC contractor in the area and he said that the lowest reading on the CAD cell isn’t necessarily the cleanest burn so I think I found a happy medium. Sometimes I just gotta be cute. Mini sidearm I made for under the large reservoir, oil comes out at around 105F so to flow thru the filter better, thru the NC ball valve then thru a 33 micron hydraulic filter to the float tank. Originally was going to use a 15 gallon barrel, couldn’t find any, as the plan was to bend a piece of copper tight enough to get it thru the large bung, todays copper tubing is crap, no matter what I did can’t even begin to get it that tight with out collapsing it, so a mini sidearm it is. All the wiring is finally done. When on “Auto” mode only the Ranco that monitors the incoming water temp from the wood boiler is on, when temp drops to 157 the Ranco closes the circuit which then energizes the rest of the circuits. When energized the Ranco on the waste oil boiler keeps the temp between 182-188. It also energizes the compressor control on the buffer tank, on at 30lbs, off at 50lbs. A five minute delay off timer keeps that circuit energized long enough to allow the compressor to come up to 160lbs to cut down on cycles. When energized the circuit also bypasses the differential controller so the pump between the waste oil boiler and the FPHX the wood boiler is hooked to runs continuously. 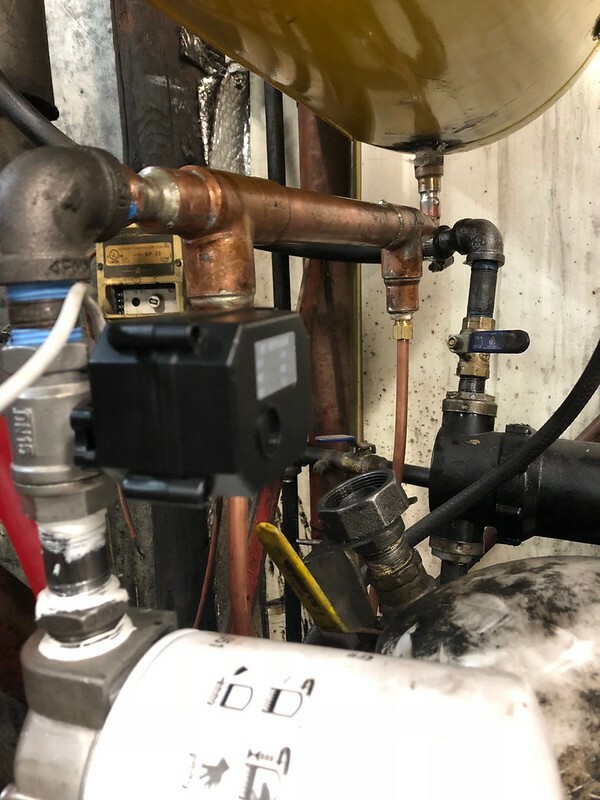 When on “Manual” setting only the Ranco on the waste oil boiler is energized and it keeps it at 182-188, especially helpful if it’s going to be a day of having the large shop door open taking equipment in and out all day. Ran three full days on “Auto” awhile back last time spring was actually around with temps in the 60’s.